Director of ADHS - Cara M. Christ, M.D., M.S. We also operate the Arizona State Hospital (ASH), which provides high acuity, inpatient psychiatric services to our state's most vulnerable residents. ADHS is proud to be a part of Arizona's strong public health system, providing safe parks, clean air, clean water, safe meals and a healthy environment to raise our families. The work we do truly adds value to our state and brings health and wellness to all Arizonans. The Strategic Map provides ADHS with a clear strategic direction over the next five years, a path for implementing the strategy and an effective approach for community involvement. 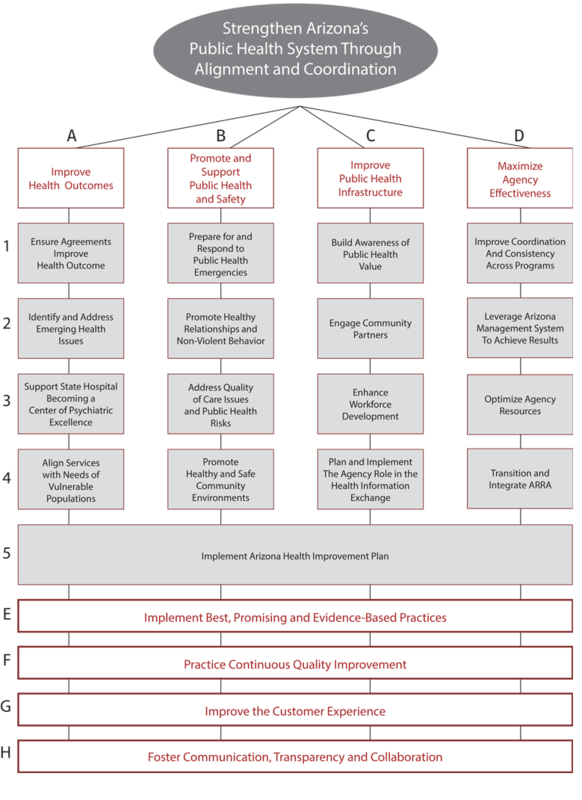 The Strategic Map allows the entire agency to come together under the single public health umbrella concentrating on activities and resources that will achieve better outcomes. Published an updated Targeted Lead Screening Plan, accompanied by an interactive lead risk map to support parents in better understanding their children's risk for lead poisoning. Updated rules for reporting and controlling communicable diseases in Arizona, improving public health's ability to respond to infectious disease threats. Introduced our Environmental Public Health Tracking Portal, a web-based interactive tool to improve public health data availability and drive informed interventions. Obtained $3.1 million in federal funding to support a comprehensive opioid/ naloxone program for first responders. Launched Healthy Kids AZ, a mobile app to provide infectious disease and injury prevention resources for schools nurses and child care staff. Began testing for Severe Combined Immunodeficiency Syndrome (SCID) through our Laboratory's Newborn Screening Program. The ASHLine trained more than 1,300 healthcare providers on clinical practices and systems protocols for improving tobacco cessation rates. Mortality rates of three of the four leading disease-related causes of death (cancer, chronic lower respiratory disease-CLRD, and Alzheimer's Disease) were reduced beyond program goals. New applications for the State Loan Repayment Program increased 100% from FY16 to FY17. About 42% of applications were from rural providers. Significant decline in children participating in the WIC program who are overweight and obese. Improved lactation support in Arizona by increasing the number of International Board-Certified Lactation Consultants (IBCLCs) to a total of 32 from a home visiting cohort and mentoring program. ADHS responded to 99% of high priority complaints on time during 2018, an important tool to keep Arizonans safe in licensed facilities. Delivering excellent customer service, ADHS Public Health Licensing reduced the time it takes to process an initial application 78% across all license types. Successfully integrated the functions of the Arizona Radiation and Regulatory Agency into ADHS, achieving reductions in survey backlogs and application processing times. High acuity, long term inpatient psychiatric care provided to persons with mental illness. 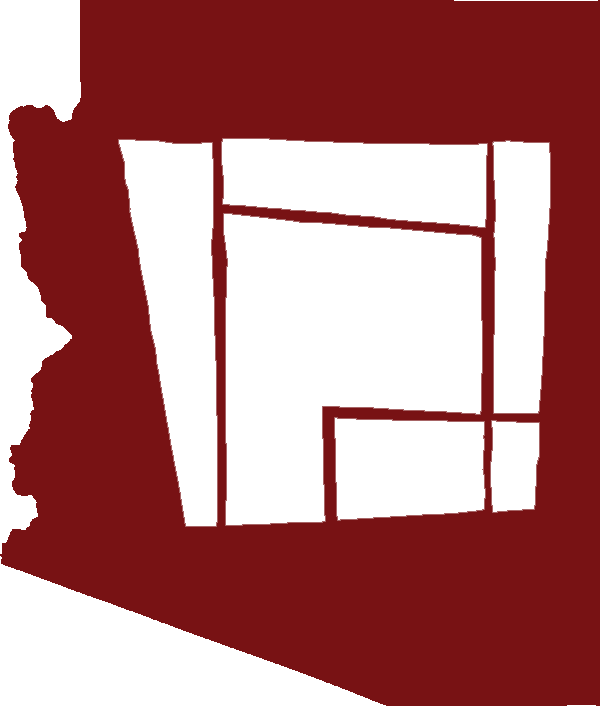 Three distinct facilities operated on ASH's campus: civil, forensic, and the Arizona Community Protection and Treatment Center (ACPTC). Civil and forensic campuses accredited by The Joint Commission. Civil campus certified by the Centers for Medicare and Medicaid Services (CMS). Reduced application time for residential facility licenses from 50 to 17 days. Provided prevention services to 100% of high risk suspect Zika cases. Improved electronic lab transmissions through automated process automatically matching 60% of received records and reducing process time. For additional reports please visit the reports website. Accreditation experts visit ADHS to conduct the onsite accreditation site visit to ensure ADHS is committed to providing the highest standards of public health practice. ADHS leads a Foodborne Hepatitis A Outbreak Investigation Tabletop Exercise for almost 110 public health partners. Individuals in attendance are tribal and county health departments, hospitals, state universities, and federal agencies including the Food and Drug Administration (FDA). The goal of the exercise is to identify assets and resources that may be needed to deal with a foodborne illness response, any gaps in current processes, as well as the role of public information and communication in outbreak response. ADHS hosts 8th annual Arizona Infectious Disease Training & Exercise (AZID2017), where approximately 400 partners from a wide variety of organizations join together to learn and share about best practices and current infectious disease trends in Arizona and surrounding states. The Healthy Kids AZ App launches during the annual AZID. The free mobile app includes infectious disease and childcare & school health flip charts, lists of public clinics, AZ specific vaccine information, and infection control guidance. Since its launch, Healthy Kids AZ has over 1,600 downloads and content is reviewed on a monthly basis to ensure up to date information is available for all of our users. New emergency opioid prescribing and treatment rules for healthcare institutions become effective. The rules impact prescribing, ordering, or administering opioids as a part of treatment in order to protect the health and safety of patients. The opioid data dashboard is made available as part of the public health emergency response to the opioid epidemic. Through the new surveillance system, ADHS begins collecting data on suspected opioid overdose, overdose fatalities, number of naloxone kits dispensed, naloxone kits administered, and cases of Neonatal Abstinence Syndrome. ADHS announces the winners of the annual Healthy Swimming Poster Contest. Nine-year-old Robbie B. from Maricopa County is the year's overall winner. This year there are more than 60 healthy swimming posters submitted from kids all across Arizona. All posters suggest ways to swim healthy and avoid getting a recreational water illness (RWI). Severe Combined Immunodeficiency (SCID) is added as the 31st disorder to Arizona’s newborn screening panel and universal testing for the disorder begins. Babies with SCID appear healthy at birth but lack a functioning immune system. Without the early identification and treatment made possible by newborn screening, Arizona babies – especially those with Hispanic and Athabascan Native American ancestry – are left vulnerable to recurrent infections that become fatal within the first year of life. This event brings together key leaders and decision makers in business, education, medical research, cancer care, government, and health policy in our state. ADHS hosts a Benefits Fair as part of the transition of the Arizona Radiation Regulatory Agency (ARRA) This fair provided information on a variety of benefits available to the ADHS team, including our Infant at Work Program and many professional development opportunities. ADHS hosts Goal Council 3 Workshop for over 200 of the states experts identifying recommendations to address Arizona’s Opioid Crisis. These recommendations help to develop the Opioid Action Plan. ADHS team meets with officials from the City of Phoenix to discuss exciting opportunities to partner while developing the Center for Psychiatric Excellence plans. ADHS issues the Opioid Overdose Epidemic Response Report and Opioid Action Plan, providing recommendations, additional response activities, and preliminary legislative ideas to Governor Doug Ducey. ADHS hosts the Strong Families AZ Home Visiting Conference for 740 home visiting professionals throughout Arizona to focus on Succeeding with Partnerships. ADHS Infant at Work program earns national recognition from the Association of State and Territorial Health Officials (ASTHO) and the de Beaumont Foundation winning the inaugural Public Health Workforce Interests and Needs Survey (PH WINS) Model Policies and Practices Challenge Best State award. The challenge highlights workforce innovations that are changing the public health field and demonstrating a strategic movement in the future of the national public health workforce. ADHS is awarded national accreditation by the Public Health Accreditation Board (PHAB) upon successful completion of the initial application, documentation review, and site visit. Accreditation reinforces the role of the Department as a leader in promoting the health and wellness of Arizonans. Through accreditation, ADHS continues collaboration with partners and showcases best practices with a focus on quality, effectiveness, and delivery of public health services. ADHS collaborates with the Organization for Safety, Asepsis, and Prevention (OSAP) in 2017 to provide training to dental providers and staff. The goal of the training is to educate dental professionals on key concepts and principles for infection prevention while delivering tools and evidence-based interventions to reduce risk within their facilities. The Arizona State Hospital successfully passes its tri-annual accreditation survey conducted by the Joint Commission. The acknowledgement reinforces best practices above and beyond general patient care. ADHS implements new death registration and Vital Records issuance system to be used, in coordination with partners statewide, to register death events and issue Vital Records in Arizona. Arizona now has a fully electronic registration system, eliminating faxes, paper, and manual processes. ADHS along with other state agencies, boards, and commissions come together to invest in the quality of life in our Arizona communities, nation, and world by contributing to the State Employee Charitable Campaign (SECC). This year, ADHS staff raises over $9,000 more than the previous year for the many critical needs of our communities. ADHS develops emergency rules for continuation of opioid required reporting. Emergency rules ensure continued reporting of suspected opioid overdoses, suspected opioid deaths, suspected cases of infants experiencing neonatal abstinence syndrome, naloxone dispensed by pharmacists, and naloxone administered by first responders (law enforcement, EMS). The Bullying Prevention social media campaign and website launches with a goal to educate and inform parents on the dangers and signs of bullying. The campaign provides tools to better define, recognize, act on, and discuss bullying with your child. ADHS convenes law enforcement and first responders from around the state to discuss expanding the Arizona Angel Initiative. This initiative provides additional opportunities from diversion programs, and encourages local law enforcement agencies to participate with the DEA Tactical Diversion Squad in order to combat Arizona’s opioid epidemic. ADHS and Maricopa County public health officials partner with the Phoenix Zoo to host a free flu vaccine clinic, accompanied by outreach on disease prevention and education from One Health. ADHS holds a public hearing and accepts public survey comments regarding the highest and best use of the Arizona State Hospital property related to the request for proposals for the Center for Psychiatric Excellence. ADHS processes nearly 300 birth certificates as a part of National Adoption Day. The event supports Arizonans in their legal process to become a family. The Arizona Women, Infants, and Children (WIC) Program successfully completes a multi-year effort to deploy an electronic system that replaces paper checks with a card to redeem benefits at authorized WIC stores. This rollout includes 119 WIC clinic locations, 600 authorized vendors (grocery stores), and 140,000 women, infants, and children. The State Drug Overdose Fatality Review comes together to begin its work to evaluate the causes and preventability of drug overdose deaths in Arizona. The work will inform system changes needed to decrease the incidence of preventable drug overdose deaths. ADHS is awarded a new 5-year grant for $3.17 million from the U.S. Centers for Disease Control and Prevention (CDC) to monitor environmental hazards impacting public health. The EPHT Explorer is a system of integrated health, exposure, and hazard information from a variety of national, state, and local sources. More than 30 ADHS employees give their time, program resources, and professional support during the annual Dental Mission of Mercy event at the Arizona State Fairgrounds. Nearly 2,000 patients in need are provided free dental care and education, some of them receiving dental care for the first time. This event helps reduce health risks and disparities related to dental diseases and improves individuals' lives by eliminating pain and suffering. New to ADHS, this plan leads the Arizona Prescription Drug Initiative Health Care Advisory Team to update Arizona’s Opioid Prescribing Guidelines for acute and chronic pain, a voluntary consensus document intended to assist clinical decision-making with the best available evidence. Identified by the Opioid Action Plan as a recommendation, ADHS convenes an Insurance Parity Task Force with representatives from each of the payer sources in the state. The goal of the Task Force is to research and provide recommendations regarding parity and standardization across the state to increase access to care and treatment. ADHS is ranked sixth in the nation on a series of 10 public health emergency preparedness measures identified by a national organization. This recognition acknowledges Arizona's ability to effectively respond to all types of emergencies and disasters. Identified by the Opioid Action Plan as a recommendation, ADHS convenes a Regulatory Workgroup with representatives from each of the professional licensing boards and enforcement agencies throughout Arizona. The goal of the Workgroup is to identify prescribing trends and discuss enforcement issues regarding their regulated communities. Focusing on the patient experience, the Human Rights Committee creates an atmosphere of holiday wonder at the Arizona State Hospital. For the second year in a row, Emma is the top name for girls and Liam is the top name for boys born in Arizona in 2017. The top baby names come from birth certificates submitted to ADHS. ADHS releases the 2018 Targeted Blood Lead Screening Plan, updating screening recommendations from 2014. The plan includes an interactive web-based map where parents can enter their address and learn about screening recommendations for their children. All children should be evaluated at 12 and 24 months of age by their health care provider by a blood test or questionnaire. ADHS assumes the authority, powers, duties, and responsibilities of ARRA, and is now responsible for protecting public health and safety by regulating, inspecting, and licensing the use and sources of radiation statewide. ADHS convenes statewide experts in medical education and training to develop a statewide minimum curriculum that covers evidence-based pain management, diagnosis and management of substance use disorders, medication-assisted treatment, and pharmaceutical interactions of commonly prescribed medications. The report provides statewide numbers and rates of vital statistics including Arizona births, reportable diseases, and hospital discharges. Public health programs use the data to understand statewide trends and determine high-risk geographical areas within our state to address public health issues. During a press conference, Governor Doug Ducey calls a Special Session of the Arizona Legislature to provide immediate consideration of legislation combating the opioid epidemic. The Arizona Legislature passes SB1001 unanimously in a four-day special session and Governor Doug Ducey signs the Arizona Opioid Epidemic Act into law to reduce overdoses and improve patient safety. In order to achieve the vision of developing a Center for Psychiatric Excellence at the Arizona State Hospital, ADHS releases an RFP seeking proposals from parties interested in the enhancement and expansion of non-ASH administered behavioral health services available to Arizonans. The Center for Psychiatric Excellence will provide state of the art, comprehensive behavioral health services for residents of Arizona and maximize vacant or unused space on the ASH campus. ADHS partners with the UA SHARE Program to teach CPR to more than 500 school-aged children at the 2018 Connect2STEM event, held at the University of Arizona Phoenix Medical Campus. The National Governor’s Association (NGA) accepts Arizona's application to form an intra-agency workgroup to develop a State Action Plan that would build on the Governor's Opioid Action Plan to specifically address Neonatal Abstinence Syndrome. The action plan is a joint effort between the Governor’s Office of Youth, Faith, and Family, ADHS, Department of Child Safety and AHCCCS. The week-long convention style event provides an opportunity for staff to showcase accomplishments, become more familiar with other projects and programs, and network with colleagues. It serves to further expand the knowledge of our workforce about the agency and how each division, bureau, and program contributes to making a difference in the lives of Arizonans. ADHS, in partnership with Arizona's Poison and Drug Information Centers, launches one of the nation’s first real-time, comprehensive hotlines for healthcare providers seeking consultation for complex patients with pain and opioid use disorder. The free hotline, the Arizona Opioid Assistance and Referral (OAR) Line, is operated 24 hours a day, seven days a week, and answered by medical experts to provide opioid-related information and support to medical providers. The State Loan Repayment Program (SLRP) launches its electronic application system beginning with Site Registration followed by Provider Application submission. The electronic application system (portal) is a result of a Continuous Quality Improvement (CQI) project aimed to provide better customer experience in applying to SLRP as well as to improve program efficiency in awarding applicants. Approximately 246 sites are successfully registered and 105 provider applications are submitted through the portal in 2018. Based on a legal review, ADHS implements changes to its procedures with the aim of bolstering the legally-mandated privacy protection of patients at ASH. The hospital provides the highest level of safe, effective, and compassionate psychiatric care for the most vulnerable mental health patients in the state. The HIV Symposium is a multi-track HIV education event collaboratively presented by the HIV Prevention and Ryan White Part B Program of ADHS, and the Maricopa County Ryan White Part A Program. Sessions highlight innovative HIV efforts in Arizona, as well as nationally recognized initiatives. More than 330 people attend the event. The 2nd Annual Arizona Extreme Heat Planning Workshop is held in Scottsdale, Arizona. The workshop is made possible through a collaborative effort between ADHS, the National Weather Service and Arizona State University and convenes representatives from organizations and departments who are on the frontlines of addressing extreme heat statewide. The goal is to better connect the various organizations that help mitigate the impacts of extreme heat and illuminates barriers to ensuring that Arizonans are safe during the summer heat. ADHS celebrates National Public Health Week (NPHW) to recognize the contributions of the public health workforce and highlight issues important to improving the health of Arizonans. In recognition of all of Arizona's public health achievements, Governor Doug Ducey proclaims this week Public Health Week in Arizona. Every day during NPHW, ADHS teams are acknowledged for their work to keep our communities and families healthy. ADHS hosts interns from the legislature to teach them more about the Arizona State Hospital and behavioral health services throughout the state. The interns take a tour through the different campuses of ASH. The CDC recognizes ADHS for our public health preparedness, demonstrating the work of our public health preparedness programs. Arizona continues to stand out for emergency operations coordination and public health laboratory testing, in addition to numerous other capabilities that we maintain and enhance. ADHS hosts the 25th annual Immunization Conference. The 2-day conference includes well over 400 attendees and consists of national and local immunization experts sharing plenary and breakout sessions. This annual conference is always sought out as it provides so much immunization information that is useful to medical assistants, nurses, pharmacists, and other medical professionals. The Arizona Opioid Epidemic Act, Senate Bill 1001, goes into effect. Provisions include continuing education requirements for health care providers, a 5-day limit for first fills of new opioid prescriptions, and additional funding for treatment. We love our employees! Governor Doug Ducey declares May 9 as Arizona State Employee Recognition Day and the ADHS leadership and Employee Recognition Committee celebrate our amazing workforce and proclaim "ADHS Employees Rock!" ADHS holds its annual “Be SunWise & Play Sun Smart Skin Cancer Prevention Student Poster Contest” in partnership with the Arizona Diamondbacks to teach children sun safety behaviors at an early age and facilitate skin cancer awareness and prevention. The Healthy Arizona Worksites Program recognizes ADHS for wellness programs - from wellness classes to breastfeeding support for new moms - that make our department a healthier place to work. Over 100 Arizona employers are recognized through different award levels for their commitment to building healthy worksites. The two-day summit brings Arizona hospitals and long-term care facilities together to learn new evidence-based practices in preventing infections and reducing harm. This training event provides education to infection preventionists and other healthcare personnel on the key concepts and basic principles for infection prevention, harm reduction, communication, and evidence-based interventions to mitigate risk within healthcare facilities. After completion of all requirements of the emergency declaration order, the Opioid Action Plan, and the implementation of the Arizona Opioid Epidemic Act, Governor Doug Ducey officially calls an end to the formal declaration of emergency. Arizona’s commitment to addressing the epidemic remains unwavering. During the Subcommittee on Border and Maritime Security of the Committee on Homeland Security hearing, ADHS provides testimony on Arizona’s response to the opioid epidemic which gained national attention. Governor Doug Ducey presents ADHS with the first-ever Governor’s Impact Award for leading the statewide response to the Opioid Epidemic Public Health Emergency and implementing the Opioid Action Plan. ADHS engages with our partners in Sonora, Mexico to expand coordination on cross-border health initiatives ensuring continuity of care for individuals. The collaboration ensures improved health outcomes for individuals emigrating to Mexico. ADHS partners with stakeholders to provide a day-long educational session for end-stage renal dialysis (ESRD) providers in Arizona. The theme of the conference is centered on patient engagement. Approximately 211 participants learn about data-driven opportunities to improve dialysis services in Arizona and share best practices in quality management, infection prevention, and emergency preparedness. Each year, ADHS compiles the Arizona Health Status and Vital Statistics Report with information on vital statistics and the health status of Arizona residents. In addition to the highlights previously outlined, the activities of the Department are chronicled on the Director's Blog. County Public Health Departments continue to serve a vital role in public health and had many accomplishments in FY2018. ADHS monitors and tracks various diseases throughout the state. Public health expenditures by the state and counties add up to millions of dollars. While obesity remains a major public health concern, our state currently faces a deadly opioid epidemic. The Arizona State Hospital serves an important role for the Department.